I just saw a bit of the game Spain vs Paraguay and I didnt like it. Anyway i'm happy that european teams defeated southamerican teams. No racism by me of course, just a sane "belonging spirit". What can we say about today's match... I could be too partial for Spain but I think we have played a very good match against a very good team that couldn't do their usual job today, and Germany couldn't do it because of Spanish job. Spain played offensive and Germany played contra, we probably deserved more goals, amazing 2nd half by us. Yeah gratz for this win, imo in the end it was deserved at least for the ability of building some dangerous actions. Germany has been a bit too much "malleable" today, dunno if it was for a planned tactic or for Spain's ball possession. I see Spain a little bit more favourite than the oranges... I only hope it won't end at penalty kicks, it would be a shame (as every final decided by this lottery). btw 81.5% share on TV. New record in Germany, 31,10 million people watched the match - 83,2%. 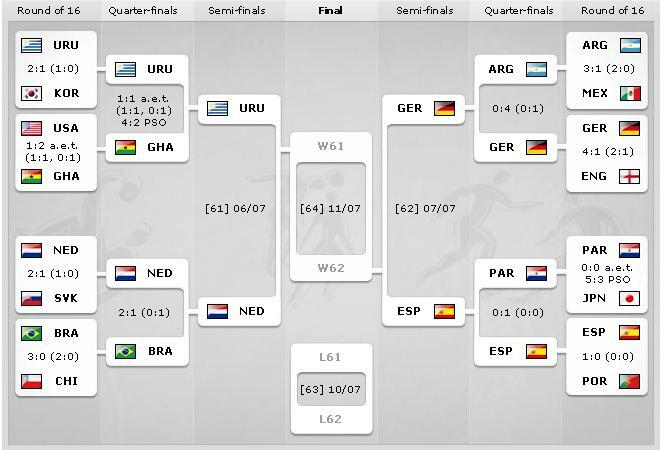 At least in this category we won ^^ But I bet 84% for spain in finals. You deserved the win guys, it was like every Barca-game.. Football total, almost football in perfection. But poor Pedro xD Don't kill him, he played not bad at all. Nice assist in the begin of the match, was almost Villas next goal. *-* i want i want i want i want !